How Long Does Beef Jerky Last? If you have ever made beef jerky before you will know that it tastes great and is a pretty simple process. It takes a while to get used to the fact that once dehydrated the jerky doesn’t necessarily need to be kept in the fridge. One of the most common questions that come up after making jerky is “How long will my beef jerky last?”. This is a good question and we shall cover the specifics in this article. 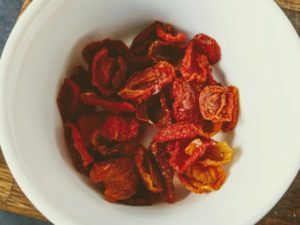 The simple answer to this question is that homemade beef jerky will usually last around 1 – 2 months if stored appropriately and can last for longer periods of times if additional methods like vacuum packing and refrigeration are used. How Is Beef Jerky Preserved? How Long Will Jerky Last? Preserving meat by drying has been done by our earliest ancestors as a means of storing food for periods when it was less available. The biggest benefit of making something like a beef jerky, it that it lasts for extended periods of time without refrigeration. 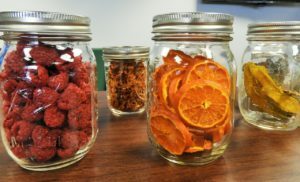 It’s Dehydrated: The bacteria and enzymes that would usually spoil meat quickly if it is not refrigerated need moisture. As beef jerky is dried the moisture that these spoilage organisms and processes need is removed creating an environment that is very difficult for enzymes or food spoilage organisms to survive. This is one of the key preservative measures that helps make your beef jerky last for long periods after making it. It’s Cured: Beef jerky is marinated in a mixture that is high in salt and sometimes sugar. The reason for beef jerky being highly seasoned with salt is not just to improve the taste. High salt and sugar environments draw moisture out of cells, not only do they draw moisture out of the beef but also out of any microorganisms that may be present on the meat. This process of salting the meat is a highly effective preserving technique. 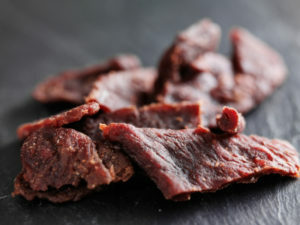 Commercial beef jerky can sometimes use nitrites to aid curing which will extend the shelf life of beef jerky more than just using regular salt. It Is Lean Meat: As jerky is dehydrated as a means of preservation, it relies on water being removed from the meat. Fats contain oils that will spoil quickly if not refrigerated. When beef is prepared for jerky nearly all the visible fat is removed from the meat. This stops the fat from going rancid and spoiling the rest of the jerky. To make sure that the beef jerky you make lasts as long as possible it is important to store it in the right way. This can make the difference between a product that will last months and months to one the will deteriorate quickly. Any food that is dried need to be stored in a way that it will not pick up excess moisture. The key to beef jerky lasting is to ensure the preservation method of drying is adhered to. 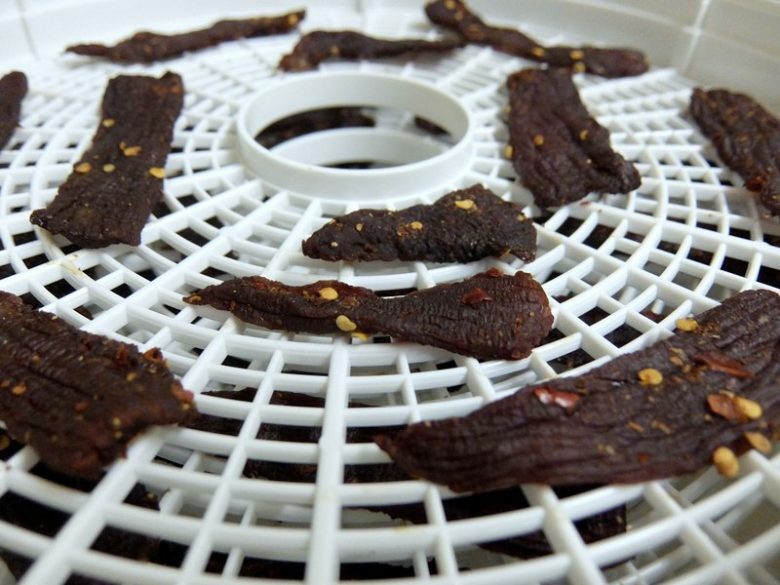 Drying beef jerky at elevated temperatures forces moisture out of the meat. If it is then left exposed at ambient temperatures it will try to draw moisture out of the air and this effect is especially prevalent in humid areas. 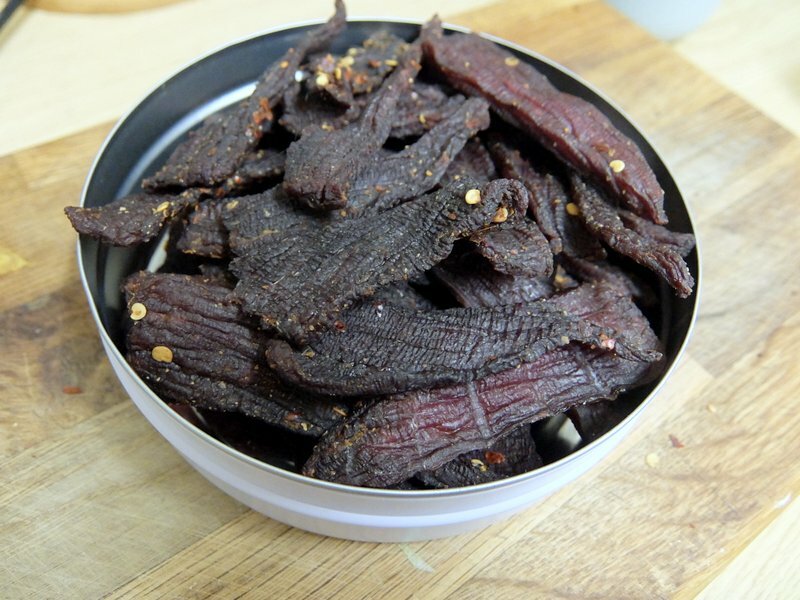 Storing the jerky in an airtight container is an easy way to make the beef jerky last longer. Most food that is kept at ambient temperatures will have the familiar “store in a cool dry place” written on it. This is the most important for food like beef jerky that have very little moisture as they will be more prone to absorbing moisture which will spoil it. Oxygen has a degrading effect on preserved food, this is why you will often find sachets of oxygen absorbers in commercial beef jerky. Oxygen promotes the deterioration of fats in products like beef jerky. As well as this most food spoilage bacteria and moulds that are going to ruin jerky need oxygen to survive. If the jerky is packaged in an oxygen-free or low oxygen environment then it will inhibit the growth of these spoilage organisms and your jerky will last longer. Keeping the jerky in an airtight container will limit the amount of oxygen exposure to a certain extent. If you wanted to you could add some oxygen absorbers yourself and this will help further. Another option is to vacuum pack your jerky which will greatly reduce oxygen exposure and is a good idea if you want to store the jerky a few weeks or a month before opening it. Doing these two things will mean you can keep the jerky for 7 – 8 months rather than 1 – 2. If you have a large amount of jerky that you have made then it can be good to package them in small packages and grab one out of the freezer every time you want it. The USDA recommendation is 1 – 2 months and this is about how long I have kept mine without any noticeable effect on the flavour and quality. If you want to keep it for longer then I would recommend vacuum packing and then freezing your jerky for best results. To be honest I always prefer mine fresh and I can’t say it hangs around that long after I make it.